How many calories do I need for weight loss? A majority of people are not overly happy with excess body weight/fat and will do just about anything to get rid of it however, they tend to over complicate matters making a simple process a huge challenge. 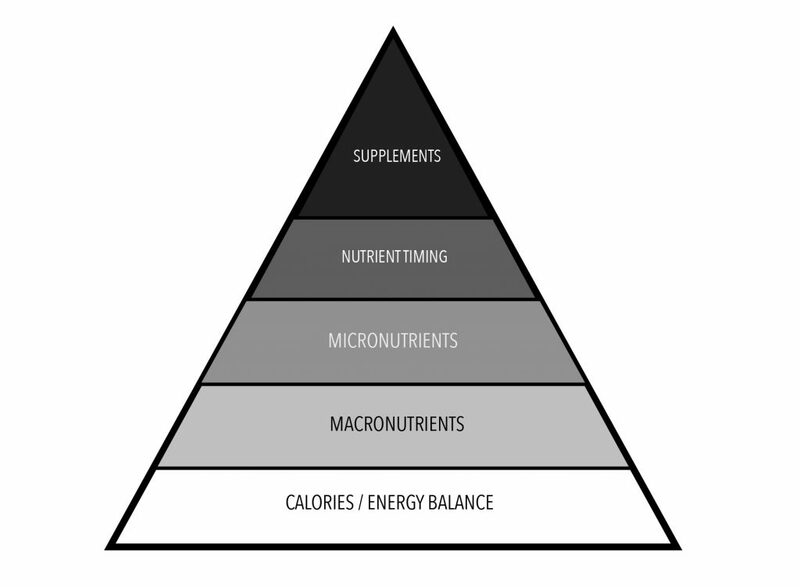 On the picture below it is an hierarchy to fat/weight loss and as you will see calories is priority. A calorie is energy that our bodies use to survive and perform activities and calories come from food and drink. To much energy (calories) going in from food and drink to that being used through everyday living and exercise will result in weight/fat gain however, stay slightly under on calories and increasing energy expenditure will assist in your fat/weight loss goals. Your body will store energy if its not used. I have heard of so many variables in trying to lose excess body fat/weight from low carb diets, low fat diets, not eating much throughout the day, reducing calories to much and the list goes on. Cutting out food groups essentially is placing your body in a caloric deficit therefore why not enjoy the foods you like but reduce the portion sizes? All of my clients who are succeeding in weight loss are NOT on a diet they are just learning the basics to fueling correctly allowing them to change their body shape. The biggest thing I come across with clients is they tend to eat for the sake of it and not for survival. When you had that coffee and slice of cake earlier, did you really need it or was it just want? And if you did want it, did you factor it in to your daily caloric intake? Managing your intake is priority but just like many we tend to slip in a few other things or not move as much and before you know it, the excess calories (energy) is storing as body fat. How many meals should I eat per day? • Eating small meals every 2 hours is pretty inconvenient and therefore unsustainable for most people. Do I need protein shakes after training? • A protein shake is digested quickly and easily by the body so it’s ideal to use around training. It’s also an easy way to increase your protein intake if you’re struggling to eat it through food, although it shouldn’t be relied on too heavily. For a sustainable weight loss plan multiply your body weight in kgs by 22 for women and 24 for men. Basal Metabolic Rate is the number of calories required to keep your body functioning at rest. BMRis also known as your body’s metabolism; therefore, any increase to your metabolic weight, such as exercise, will increase your BMR. So lets take a look when you factor in your activity levels. The chart below will factor in your exercise levels. Be as honest as you can for accurate caloric intake. The female who is 72 kgs is allowed 1582 calories just to function, if she is moderately active she will need to multiply 1582 calories by the formula as stated below in the activity chart , moderately active which is 1.55. However if she was sedentary 1582 calories x 1.2 = 1898 calories daily. Hopefully you have now worked out your daily caloric intake, energy from food and drinks. Vegetables, potatoes, lean meats, fish, grains etc are low in calories which allows you to eat more volume to that of calorie dense foods such as take away, cakes, ice cream, processed foods etc. So you can see eating a balanced healthy diet is more productive to weight loss to that of the other stuff. What happens if I have an event coming up where I know I will consume more? The person who weighs 72 kgs above has 2452 calories daily to consume because she is moderately active. Multiply that by 7 days = 17,164 calories weekly. Why not reduce your daily count to 2000 calories saving 452 a day towards the weekend or event, a whopping 2712 calories saved to use for beer, wine and pizza? Remember calories are the basics to weight/fat loss sticking to it is not as easy however, if you are determined and want it badly then you will succeed. Please do not fall for the no carb diets, shake diets etc as these are all just fads. Remain in a caloric deficit and you will succeed. Check out my website today and start to achieve with the help of my Academy. < Previous Are you wanting to be a healthier, fitter and leaner version of yourself? 2019 could be your year.